I would recommend Textile Design to others because it is a lively and exciting course that has a real sense of community with everyone making you feel welcome. What do you enjoy most about studying Textile Design? “One of the things I enjoy most about the course is the freedom you’re given to explore your own style. I really enjoy how we are constantly pushed to be experimental in order to create successful media and samples. Has the course included and live projects, briefs or industry competitions? “In Year Two we’ve been given the opportunity to work in small teams on a Next AW18/19 menswear brief. The opportunity to present a collection to industry alongside my team is an extremely rewarding experience, and is one that will give me the confidence for my future career. I am really enjoying the interaction with my fellow course mates and the combined skills that we are able to share with each other. “Staff on the course are extremely supportive and helpful. Tutorial sessions are organised on a regular basis as well as one-to-one’s if extra support is needed. The course staff are great at giving both design advice as well as technical support. 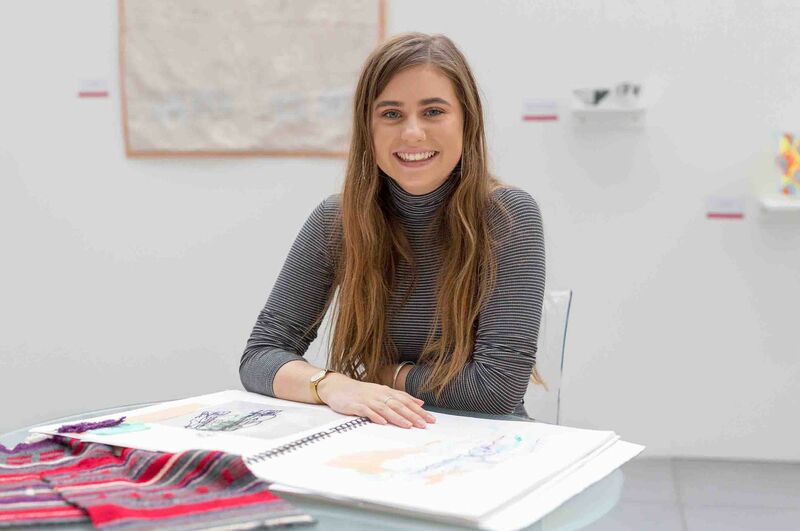 “There are a vast range of facilities on offer to art and design students at NTU whether this be the large workshop spaces, the on campus art shop or Bonington Gallery that holds many exhibitions and events throughout the year. Would you recommend the BA (Hons) Textile Design course to others?